The Freedonia Group has released a new study: Global Off-Road Equipment Technology 2019. Global demand for off-road equipment is forecast to reach $471 billion in 2019, rising 6.5 percent from 2018 levels.Countries in the Asia/Pacific region will account for nearly half of sales gains — despite only modest advances in the massive Chinese market, where demand for mining equipment is expected to fall slightly after two years of rapid recovery. Among regions, the fastest sales gains in 2019 are projected for Central and South America and the Africa/Mideast region, with double-digit growth forecast for both areas. These and other trends are presented in Global Off-Road Equipment Technology 2019, a new study from The Freedonia Group, a Cleveland-based industry research firm. Through 2023, Central and South America will remain the fastest growing regional market with 8 percent annual growth.The Asia/Pacific region will account for 65 percent of all sales gains on the strength of the large Chinese market where demand will accelerate as construction equipment customers make replacement purchases that they delayed during the recent slowdown in China's construction sector. 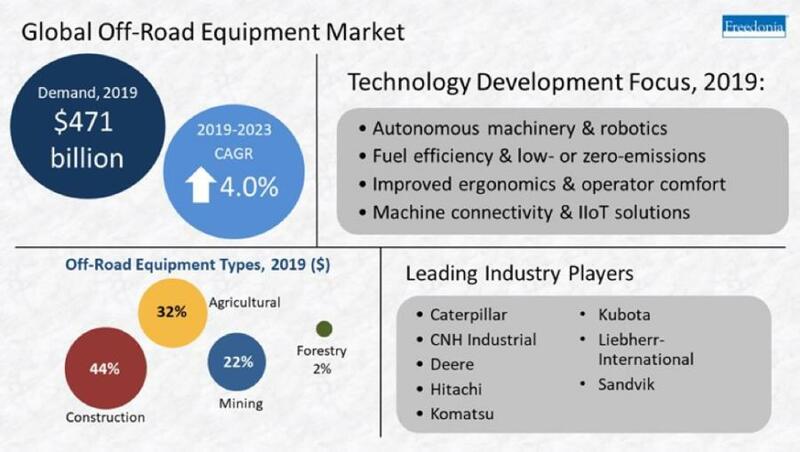 High-income countries — including Canada, Japan, and the United States — are expected to see sales growth for off-road equipment moderate through 2023 after reaching a cyclical peak. Demand in western Europe will remain relatively slow through 2023, restrained to some extent by the large amount of advanced equipment already in use in the region and the growing popularity of rental services. In the large U.S. market, tariffs and counter-tariffs on selected machinery and steel and aluminum parts negatively affected new purchases in 2018 by increasing prices for agricultural and mining equipment.In July 2018, for instance, the U.S.-imposed new tariffs on plows, mowers, combine harvester-threshers and other farm machinery imported from China, leading to a reduction in imports. However, between 2019 and 2023, customers are expected to invest in purchases that they have recently delayed due to price surcharges. The Freedonia Group is an international industrial research company publishing more than 100 studies annually. Since 1985, it has provided research to customers ranging in size from global conglomerates to one-person consulting firms. More than 90 percent of the industrial companies in the Fortune 500 use Freedonia Group research to help with their strategic planning. Additional Machinery & Equipment studies can be accessed at www.freedoniagroup.com, www.marketresearch.com and www.profound.com.